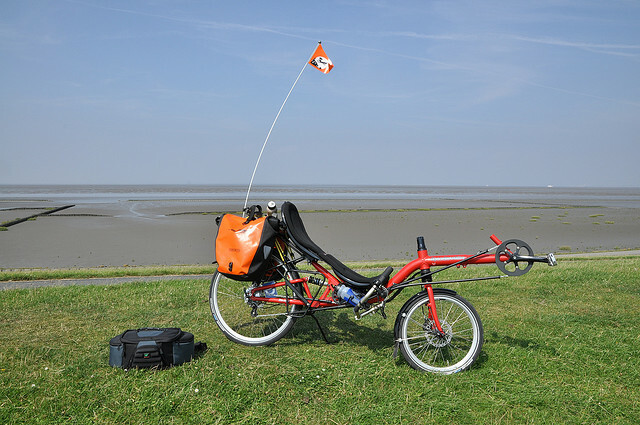 Getting a high safety flag is common on recumbents (and trailers), at least in the US. The solution is to persuade your wife that she will be seen. Obviously you can make the bike more visible, as the other answers suggest, but this is probably an emotional issue rather than a reasoned one. She feels less visible on the recumbent. The solution to the feeling is not so much reasoned argument as it is to start riding and focus on riding in places that she feels safe. Try to balance that against being exposed to motorists, so look for quiet back streets and places where bike paths cross roads. Avoid car parks because those are insanely dangerous even if they're low-speed. If she doesn't have a recumbent yet, a velomobile might also help. The combination of feeling somewhat enclosed and actually being surrounded by a huge blob of colour does wonders. Not to mention the (almost always positive) comments the velo gets. Faling that, a tailbox is a useful addition - it provides storage as well as a block of colour. I've never had a car not see me, who would have seen a bicycle. That said, it's crucial to bike safely and to stay where the cars are looking: in the street, not the gutter or sidewalk. I also use a flag and reflectors. I particularly like reflectors on my body and helmet, since we perceive body motion more easily than machine (straight line) motion. That said, flags don't help the worst visibility problem: when a car is approaching from a side street and not looking in your lane. Your front gears may be the only part visible, and they blend in at night. You need to grab that car's attention, so I have reflective tape all over the sides of my pedals. Overall, you are probably going to be safer on a recumbent than a conventional upright bike. Remember, a conventional bike can be hidden by vans and buses. The key thing, in my limited experience, is to stay well out of the gutter. Refuse to be intimidated by cars behind wanting you out of the way. Make sure you are where you can be seen. For instance, if two cars facing each other are turning right (across the road in the UK), just hang back away from the curb. I'd add that getting reflectors and a flashing tail light, along with some sort of front flasher, will increase visibility. Get a really high and visible safety flag. 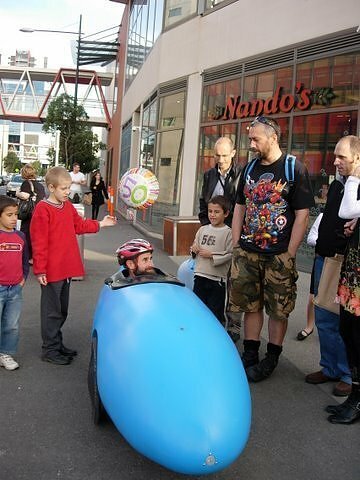 Remember that as a recumbent rider you'll quickly grow a large stomach and beard to cushion you from car impacts. Not the answer you're looking for? Browse other questions tagged safety recumbent or ask your own question.